Are you ready for a crazy-good cookie that’s made from a surprising ingredient? I know, “sweet potato” and “cookie” are not often found in the same sentence. But they should be! These spicy little treats are full of the warm flavors of cinnamon and ginger, sweetened by a little natural organic evaporated cane juice (or rapadura) and the natural goodness of sweet potato. They’re made with gluten free flour mixed with oat flour, and the combination of mashed sweet potato and oat flour give them a wonderful texture. I couldn’t resist topping some with a little chocolate chunk…others I sprinkled with cinnamon sugar. I was tempted to eat the whole bowl of batter raw, and I could have safely done so because these little vegan gems are egg-free. Start with a sweet potato, some oats, gluten free flour, fresh ginger, lots of cinnamon, and some melted coconut oil. You’ll need 1/2 cup of sweetener, I used evaporated cane juice (but you can choose your favorite). You’ll need some baking soda and aluminum free baking powder, and if you’d like you can add organic fair trade chocolate chunks on top…or toss in a cup of chocolate chips, you only live once! 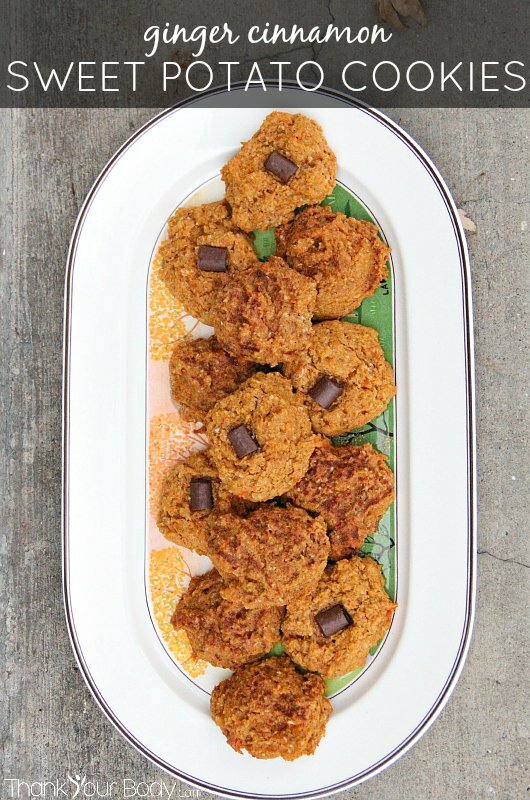 I ran across this recipe at the Go Dairy Free blog, where a wealth of fun recipes can be found. First, wash a sweet potato and cut it in half. Prick both halves all over with a fork, then lay them cut-side-down in a baking dish or pan. Bake them at 400 degrees until they’re quite soft (about an hour, depending on the size of your potato). Remove it from the oven and let it cool enough to be handled. Mix together all the dry ingredients (including the grated ginger). Then, scoop out the potato with a spoon and mash it well…you’ll need a cup of mashed sweet potato (mine may have been a yam…I had both in the pantry and, well, the outsides look a lot alike). Add the potato to the dry ingredients, and pour in 1/2 cup of melted coconut oil. Stir the batter together well. Drop the cookies onto a parchment lined pan, a tablespoonful at a time. If you want, press the chocolate pieces onto the top of each cookie…or sprinkle them with cinnamon sugar. Bake them for 10-12 minutes, and then let them cool. I can’t decide which type I like better, the chocolate or the cinnamon! Both are delicious, soft and chewy and just sweet enough. Who knew that sweet potato (or yams) could be so amazing in baked goods? This opens a whole new world of healthy orange-tinted treats! This recipe was slightly adapted to make these delicious ginger-cinnamon sweet potato cookies - you'll love how soft and moist these cookies are. Wash the sweet potato and cut it in half. Prick both halves with a fork, then put them cut-side-down in a baking dish. Bake at 400 degrees for about an hour, or until the potato is very soft. Remove them from the oven, and lower the oven temp to 350 degrees. Set the potato aside to cool. In a large bowl, mix together all the dry ingredients (including the ginger). Scoop out the sweet potato and discard the skin. Mash is well with a fork, and add the mashed potato to the dry ingredients. Melt the coconut oil, and pour it into the bowl as well. Stir the batter well, until everything is combined. 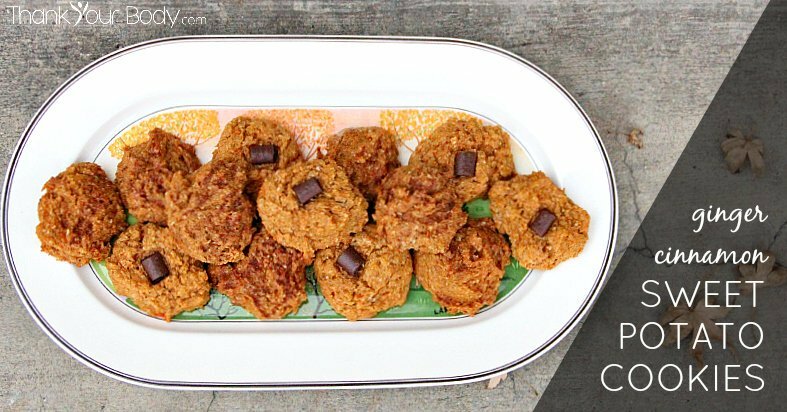 Drop by heaping tablespoonful onto a parchment lined cookie sheet. If you'd like, press a chocolate piece on each cookie or sprinkle them with cinnamon sugar. Bake at 350 degrees for 10-12 minutes, until the edges just start to brown. Remove the cookies and allow them to cool before serving. Have you ever tried baking with sweet potato?